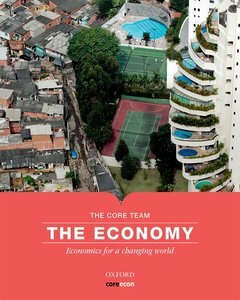 The only introductory economics text to equip students to address today's pressing problems by mastering the conceptual and quantitative tools of contemporary economics. OUP has partnered with the international collaborative project of CORE researchers and teachers to bring students a book and learning system that complements and enhances CORE's open-access online e-book. The Economy: - is a new approach that integrates recent developments in economics including contract theory, strategic interaction, behavioural economics and financial instability - challenges students to address inequality, climate change, economic instability, wealth creation and innovation and other problems - provides a unified treatment of micro- and macroeconomics - motivates all models and concepts by evidence and real-world applications - uses interactive student-paced model-building - has been adopted as the standard principles course at University College London, Sciences Po Paris and the Toulouse School of Economics A new economics for the principles course The Economy begins with social interactions using elementary game theory and institutions modelled as rules of the game. This provides the basis for a modern treatment of markets including price-making as well as price-taking, the exercise of power, and the importance of social norms and adjustment to disequilibria. Introducing labour and credit markets with incomplete contracts allows a consistent treatment of aggregate employment and fluctuations without the need for ad hoc sticky price and wage assumptions. Banks create money by extending credit and a central bank seeks to implement a target inflation rate. Growth and instability are illustrated from the Great Depression, through the post-war golden age of capitalism through to the financial crisis and ensuing uncertainties. Students acquire an understanding of the past and current evolution of the economy in its social and environmental context, equipping them to marshal evidence and articulate positions about contemporary policy issues. Pedagogical features · Economist in Action videos by Al Roth, James Heckman, Thomas Piketty, and others give students a glimpse of what economists do and how they engage in real policy questions · How economists learn from facts boxes introduce students to research practice including how to identify causation using experiments and other methods · When economists disagree features engage the student with evidence and controversies · The Read more suggestions direct the reader to resources they can consult to take their learning further · Student-paced interactive diagrams suited to diverse learner capabilities are available within the CORE open access ebook available here: http://www.core-econ.org/ · Multiple-choice questions (with explanations of correct and incorrect answers) allow students to self-test their understanding · Great Economists panels showcase a range of influential thinkers who have shaped the path of economics · Definitions explain important terms right where needed · Einsteins provide an opportunity for readers to explore the quantitative aspects of the topics under discussion in more detail · Online Leibniz calculus supplements provide a calculus-based course option, enhancing flexibility of use. The Economy is further augmented by the online learning and assessment tool, Dashboard, making it the complete solution for teaching and learning the principles of economics. Additional support resources for the lecturer include: · Lecture slides plus animated slides of all figures and charts · 250 data sets in Excel for student exercises · Unit by unit guides to teaching · Suggested course structures for standalone micro and macro, and a course for non-majors The use of The Economy also brings to lecturers membership of a growing global network of curriculum innovators changing how economics is taught worldwide. Samuel Bowles heads the Behavioral Sciences Program at the Santa Fe Institute. He has taught economics at Harvard, at the University of Massachusetts and University of Siena. His books include Microeconomics: Behavior, Institutions and Evolution (2005) The New Economics of Inequality and Redistribution (2012). He has also served as an economic advisor to Nelson Mandela and presidential candidate Robert F. Kennedy. Wendy Carlin directs the CORE project. She is Professor of Economics at University College London and a Research Fellow of the CEPR. She is on the Expert Advisory Panel, Office for Budget Responsibility in the UK. With David Soskice she has co-authored three books: Macroeconomics and the Wage Bargain (1990), Macroeconomics: Imperfections, Institutions and Policies (2006) and Macroeconomics: Institutions, Instability and the Financial System (2015). For more than a decade she was co-managing editor of Economics of Transition. In 2016 Wendy was awarded the CBE for services to economics and public finance. Margaret Stevens is Professor of Economics and Head of Department of Economics at the University of Oxford, where she has taught undergraduates studying PPE (Philosophy, Politics and Economics) since 1993. Her research interests are in labour economics and public economics, especially public policy issues relating to health, education and vocational training.